Please visit our Open House at 620 26TH AVE W in Vancouver. GRACE ESTATES. The one you've been waiting for. This is an extremely well kept, two bedroom and den, three bathroom, two level townhouse. The den could easily be a 3rd bedroom. Enter through the Foyer, The large principal rooms are perfectfor guests and house sized furniture. There is a gracious dining room, bright and spacious living room plus South kitchen with eating area. Views of the city and mountains from the Master Bedroom with walk-in closet and ensuite bath. Mature landscaped grounds, two side by side secured parking spots, lots of outdoor space and an easy access to the Canada Line, Cambie Village, The Hospital, Oakridge and Downtown. Comfortable, secure, quiet, private, exclusive and convenient. YOU'LL LOVE IT! I have listed a new property at 620 26TH AVE W in Vancouver. I have sold a property at 3570 TRIUMPH ST in Vancouver. "THE HEIGHTS" This is a picture perfect home. The main floor is open plan with two bedrooms, living and dining rooms plus an updated kitchen and bath. There are corner windows to make everything bright and a huge front room window,stainless steel appliances, LG fridge, KitchenAid stove, microwave range hood and Bosch dishwasher. Downstairs has high ceilings and could easily be converted to a nice suite or as more living space for upstairs. South exposed backyard, a NEW roof in 2011, and a NEW double garage. There is a Sunny solarium off the back of the house. Very quick to downtown and convenient to shopping, recreation and transportation. This is a great spot and a wonderful place to call your own. YOU'LL LOVE IT! VANCOUVER, B.C. 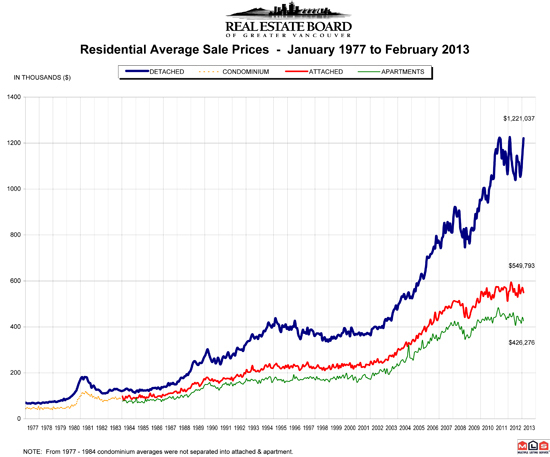 – March 4, 2013 – Home sale activity has trended below historical averages for a full year in the Greater Vancouver housing market. The Real Estate Board of Greater Vancouver (REBGV) reports that residential property sales in Greater Vancouver reached 1,797 on the Multiple Listing Service® (MLS®) in February 2013. This represents a 29.4 percent decrease compared to the 2,545 sales recorded in February 2012, and a 33 percent increase compared to the 1,351 sales in January 2012. Last month’s sales were the second lowest February total in the region since 2001 and 30.9 percent below the 10-year sales average for the month. The sales-to-active-listings ratio currently sits at 12.2 percent in Greater Vancouver, a two percent increase from last month. This is the first time this ratio has been above 11 percent since June 2012. New listings for detached, attached and apartment properties in Greater Vancouver totalled 4,833 in February. This represents a 13 percent decline compared to the 5,552 new listings reported in February 2012 and a 5.8 percent decline from the 5,128 new listings in January. Last month’s new listing count was 4 percent higher than the region’s 10-year new listing average for the month. The total number of properties currently listed for sale on the Greater Vancouver MLS® is 14,789, a 5.2 percent increase compared to February 2012 and an 11.6 percent increase compared to January 2013. Since reaching a peak in May of $625,100, the MLS® Home Price Index composite benchmark price for all residential properties in Greater Vancouver has declined 5.6 percent to $590,400. This represents a 3.3 percent decline compared to this time last year. Sales of detached properties in February 2013 reached 704, a decrease of 36.1 percent from the 1,101 detached sales recorded in February 2012, and a 49.8 per cent decrease from the 1,402 units sold in February 2011. The benchmark price for detached properties decreased 4.5 percent from February 2012 to $901,500. Since reaching a peak in May 2012, the benchmark price of a detached property has declined 6.8 percent. Sales of apartment properties reached 760 in February 2013, a decline of 25.5 percent compared to the 1,020 sales in February 2012, and a decrease of 37 percent compared to the 1,206 sales in February 2011. The benchmark price of an apartment property decreased 3 percent from February 2012 to $360,400. Since reaching a peak in May 2012, the benchmark price of an apartment property has declined 5.1 percent. Attached property sales in February 2013 totalled 333, a decline of 21.5 percent compared to the 424 sales in February 2012, and a 31.9 percent decrease from the 489 attached properties sold in February 2011. The benchmark price of an attached unit decreased 0.7 percent between February 2012 and 2013 to $455,500. Since reaching a peak in April 2012, the benchmark price of an attached property has declined 6.5 percent.